With manufacturers under more pressure than ever to deliver new products faster while reducing cost, additive manufacturing (AM) offers a remedy. AM technology can pay off not only when applied to parts and products, but tooling as well. Durable tooling often represents a significant cost, and recent advances in 3D printing can reduce costs drastically while accelerating time-to-market. Case in point: Markforged printers creating metallic and composite gripper jaws as robotic end-of-arm tools for Dixon Valve & Coupling. 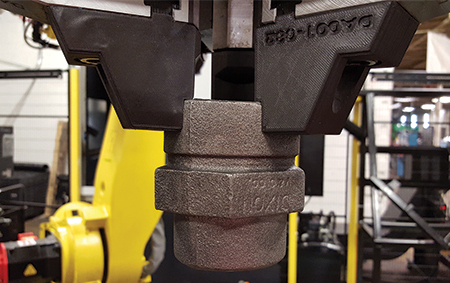 Manufacturing for more than a century, Dixon, headquartered in Chestertown, MD, needed jaws strong enough to withstand the physical and chemical rigors of a manufacturing environment. It also needed a cost-effective solution to cut the amount of time engineers spent making tools. Mounting on a robot that transfers fittings between machining centers, the jaws had to survive corrosive fluids while subjected to repeated clamping. Using a Markforged Mark Two printer and Onyx, the sole 3D-printed material able to survive Dixon’s SEO chemical-resistance-qualification test, Dixon now can retool a robotic arm within 24 hr. By printing, instead of machining, these jaws, Dixon cut fabrication time from 144 to 9 hr., a time savings of 93 percent. And, fabrication cost decreased by 97 percent, from $290 to $9, according to Markforged officials. In operation, Dixon officials report that both the composite and metallic jaws are robust enough to grip and move stainless-steel pipe couplings. Markforged officials report that its manufacturing customers often print 10 to 50 percent of durable tooling, which, the officials note, represents significant value when factoring in the 80-percent average cost savings of a 3D printed versus a machined part, with printed parts delivered 85 percent more quickly. AM production in these instances also offers line-changeover efficiency, line-optimization and design-cycle-time reduction, reduced scrap rate, increased throughput, and ergonomic benefits for operators.